Venture builders are companies which evolve themselves through a combination of start-up developments, shared resources and hard work. Occasionally such companies are also referred to as start-up foundries, start-up factories, start-up studios or a generalised collection of similar words. There are several reasons a business might decide to build various businesses within it, think of it as a business’s ability to acquire and distribute knowledge. The more you put into the various start-ups, the more likely they are to succeed and the more likely they are to become independent of the venture builders. The goal is for venture builders to provide a variety of attributes which will inevitably result in the success of a start-up. Venture builders are the nest, start-ups are the eggs and eventually those eggs are going to hatch into beautiful tech birds and fly away. The model creates start-ups, from the start, onwards and upwards. Venture builders are not to be misinterpreted as accelerators or incubators in the traditional or operational sense of venture capital firms. Instead, their focus is simply the process of consistent start-up creation, built using an interdisciplinary body and an inventive, yet highly effective infrastructure. This makes venture builders practicable and authentic business models. The benefit to building several start-ups at once is the ability to rapidly develop and provide prototypes of products. The simultaneous nature of venture builders means that projects are able to share coveted resources, management, infrastructures, software and skilled community competencies. At App’n’roll, we acknowledge that venture builders are not just limited to software houses or built solely by developers, they involve a whole host of other integrative processes, including but not limited to design, customer development, business development, market research, branding, mobile marketing, hiring and sales. A solution found for a complex problem one start-up encounters, may solve several other internal issues for other start-ups housed within. The venture builders ability to deliver whole products through the inclusion of several perspectives, code, design, marketing, distribution and analysis, enables clients to feel a connection with the entire company. The venture-building philosophy is a rising movement in the tech and start-up industries. The most notable venture builders include Obvious Corp., which spun off Twitter and Medium; Mark Levin’s HVF (Hard Valuable Fun), which produced Affirm.com and Glow.com; Betaworks, whose portfolio includes Instapaper and Blend, and Germany’s Rocket Internet (PayMill, Jumia, FoodPanda, etc.). Although these highly successful companies have obvious differences in their business models, they also have significant characteristics in common. They use shared resources (capital, teams, connections, etc.) to launch solutions that then operate as fully-operational companies. If we take some of the differences into account, we know that many venture builders invest in seed funding in order to generate adequate interest from investors and to develop prototypes of products, they also incubate and initiate concepts within their company. Some venture builders adopt co-founder titles depending on the start-up in question and others take larger samples of equity than others. There are several examples of venture builders currently providing this service in its entirety, launching international ventures from idea to fruition, Monkey Inferno,Sandbox Industries, IdeaLab,Forward Partners and Makeshiftto name but a few. There will always be concerns from investors and entrepreneurs with regards to the start-up studio model. There’s a great article on how investors should attempt to approach venture builders (or in this case, start-up studios) when confronted by a series of seemingly differing start-ups (all unique in their own right) within venture builders. It mentions how the studio model can occasionally cause confusion and the best ways to remedy this. 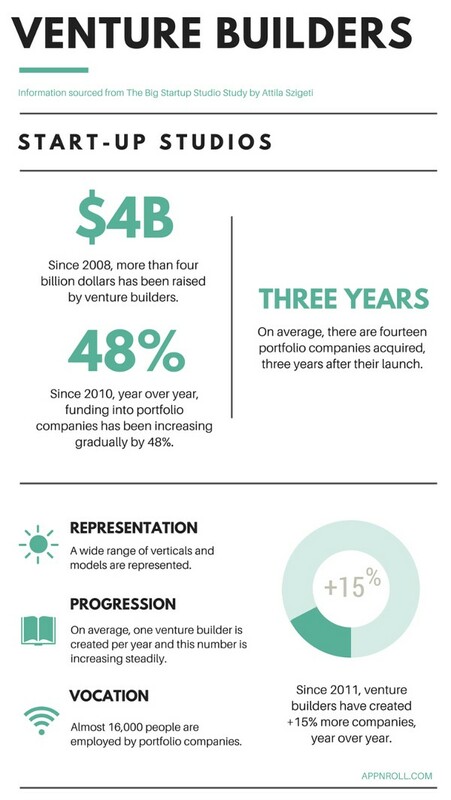 There’s no doubt that Venture builders are on the rise and publicly available data exists (CrunchBase and MatterMark) to support these inspiring insights. “The studio model is now on the accelerating part of the hockey-stick curve.” (Szigeti, 2016) There did appear to be a low number of studios with +15% output for the year 2015 but this is likely due to studios not registering their projects into CrunchBase at an earlier stage, causing latency in available data. In 1996, Idealab started something which is now an increasing trend, with various venture builders advancing worldwide and in 2016, this number is set to thrive. In order to make venture builders more transparent, it comes down to the people behind the scenes, best practices, opportunities, in company culture and motivation. Thoroughly examining how venture builders are funded, ROI, their terms and their investors will inevitably lead to a better overall experience and successful venture builders will raise additional funds for growth, become a dependable deal source and help hire talent. If you’re interested in learning more about venture builders or interested in working together on founding one, please don’t hesitate to get in touch with us via Facebook, Twitter or in the comments. If you would like to know more about how we started our own venture builder, see our previous post Rise of the Phoenix.